Anyways, I've been using RM for years now and have a long on-going project in development. Preferred engine is XP. I create my own sprites, tilesets, battlers etc. but anyway, greetings Holder, I hope you enjoy your stay here and if youre feeling bored, we have an RP on the site known as Incannica. Also, I'd love to see some of your works that youre talking about, especially the tiles. Welcome Holder, do check out Incannica and try to have a good time here. Oh?! You must be the famous Holder from RRR. Am I right? Anyhow, welcome. And yes, as Notte stated I would really love to see some of your completed works. BATTLERS FTW. I suppose this is because of Forumotion's new updates. I'm trying to look in the new stuff added so, I think this'll get fixed sooner. 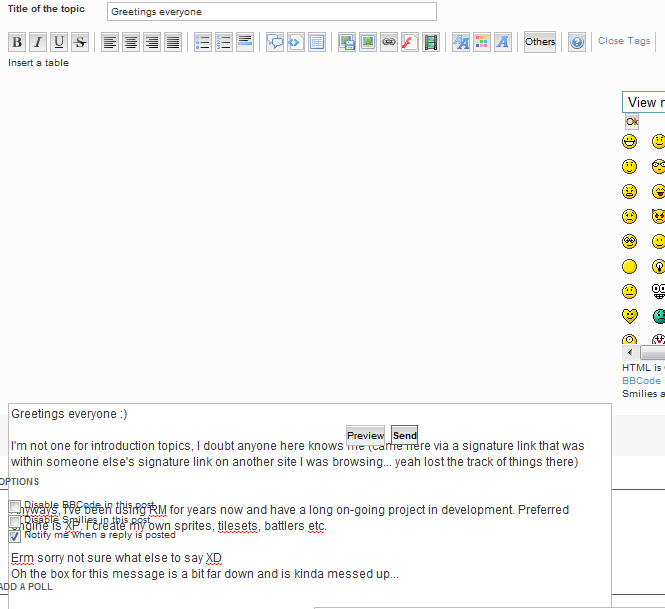 The problem is, whenever you hover your mouse into the smiley list, the post message box suddenly scrolls down. Unfortunately, I haven't found any possible solutions yet. :) I don't think I've ever been called famous before, thanks for the really nice welcomes. Okay I actually forgot where I placed my password for this place, I've not just dropped out. Really like the newer look, it's a nice change from the average colours. I'm glad you like the new look, Holder ^_^; And welcome back ~ :3 I'll check out your Tileset Develpment right now.